NYC DEP Chief Engineer to Present an Overview of DEP’s Capital Maintenance Projects on April 14th at the joint ASME – NYSSPE event at the National Grid Center in Brooklyn NY. On Thursday evening, April 14th, 2016, Joseph Olewnicki, P.E., Chief Engineer of the Division of Capital Maintenance of the NYC Department of Environmental Protection will present an overview of the engineering operations and Capital Maintenance projects throughout the City of New York. In this presentation, Mr. Olewnicki will outline DEP’s operations in the City and in particular what the Bureau of Wastewater Treatment does, as well as discuss several capital and maintenance projects. There are still a limited number of seating remaining for this 1-PDH presentation. Joseph Olewnicki, P.E., manages the Division of Capital Maintenance for the Bureau of Wastewater Treatment at DEP. 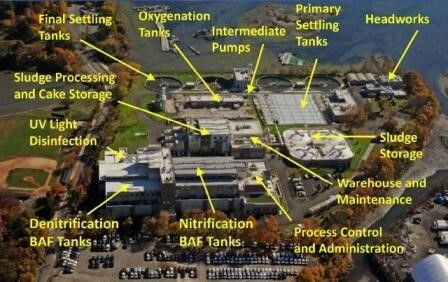 The Bureau of Wastewater handles and treats all sewage for the 5 boroughs of NYC as well as operates and maintains 14 sewage treatment plants, 6 sludge dewatering facilities, 3 CSO facilities, 2 aeration facilities, 98 pumping stations, 500+ outfalls and 138 miles of sewage interceptors. The engineering program run by this division is responsible for capital projects that maintain wastewater handling and treatment systems and include both planned upgrades and emergency response. Former NYC DDC Deputy Assistant Commissioner and NYC DOT Director of Roadway Design, Walter A. Zimmerman P.E. Honored for his Distinguished Engineering Career. Walter A. Zimmerman P.E. was recently honored and received The New York State Society of Professional Engineers Certificate of Excellence for his distinguished career as a professional engineer in official positions of several agencies of the City of New York, including his service as Deputy Assistant Commissioner of the NYC Department of Design and Construction, Director of Roadway Design at the NYC Department of Transportation and Supervising Engineer of the Bureau of Topography at the office of the Borough President of the Bronx. 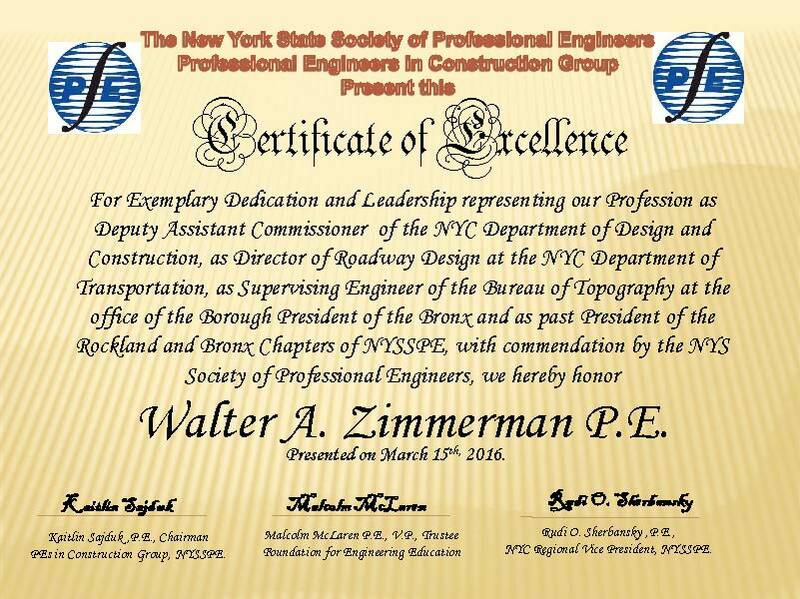 Mr. Zimmerman was also honored for his exemplary dedication in supporting the engineering profession as past-president of the Rockland and Bronx Chapters of the New York State Society of Professional Engineers (NYSSPE). Beginning March 2016, the NYC Department of Buildings (DOB) will issue DOB Violations for Energy Code Infractions that are Class 2 (major) violations, which carry a monetary penalty. Additionally, the DOB may also issue Stop Work Orders (SWO) for Energy Code Infractions and violations. If the cure date has passed, SWOs will not be lifted unless, the violation is paid and an approved certificate of correction has been obtained. Failure to correct violating condition(s) may negatively affect the ability to sell, refinance, and obtain a new Certificate of Occupancy or a Letter of Completion for a property. For more information, refer to this March 2016 DOB Bulletin. The Annual Celebration of Engineers’ Week in New York City kicked off on Thursday, February 18, 2016 at the NYU Tandon School of Engineering (NYU-Polytechnic) in downtown Brooklyn, NY. 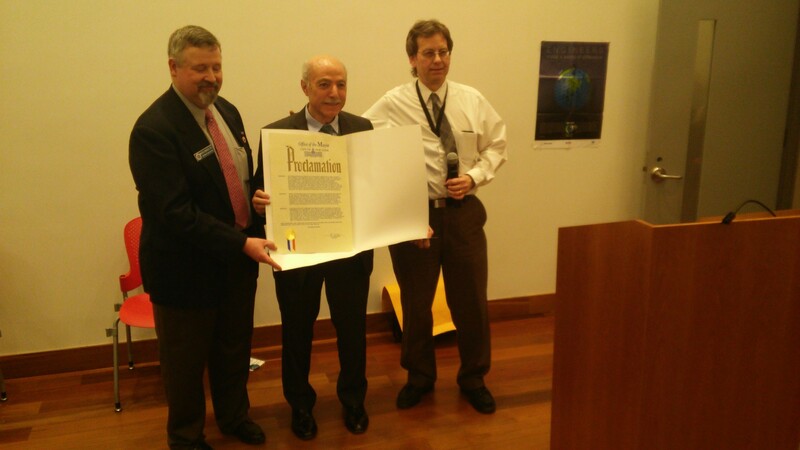 The NYC Mayor’s Proclamation ceremony was conducted and presented by Salvatore Galletta PE, MESC Program Chair, Wasyl Kinach, P.E., MESC Chair and Mark Klein, P.E. President of the Municipal Engineers of the City of New York. In reaction to an outbreak of Legionnaire’s disease in the South Bronx, New York City has issued a new law requiring all building owners to register their cooling towers, evaporative condensers, and fluid containers with the Department of Buildings. Legionnaire’s disease is a potentially life threatening type of pneumonia caused the bacteria legionella. Several cooling tours in the South Bronx tested positive for legionella. Public water for drinking and bathing has fortunately remained unaffected by the outbreak. This law was enacted to ensure public safety by allowing the DOB to monitor the condition and maintenance of this equipment. This law has been effective since August 18th, and owners have within 30 days of its enactment to register all existing equipment, and new equipment must be registered prior to operation. Equipment can be registered online through the NYC Cooling Tower Registration Portal. Owners will be responsible for annually certifying that their cooling towers, evaporative condensers, and fluid containers follow the regulations of the NYC Department of Health and Mental Hygiene (DOHMH), and that a maintenance plan is in order. In light of the success of last year’s event, the New York State Society of Professional Engineers (NYSSPE) is proud to announce our 2nd Annual New York City Design Professionals Day! The event will take place October 22nd, 2015 at NYU Polytechnic University. The event will feature New York City design professionals and officials who will speak on various topics related to the engineering profession as well as important factors in the design process. We are excited to announce that the New York City Department of Buildings (DOB) Commissioner Rick Chandler, PE will be a returning keynote speaker. Chandler will be presenting his vision for transformation of the Department, as detailed in his plan titled Building One City. Other speakers will include Timothy Lynch, PE, Assistant Commissioner of Investigative Engineering Services, and Dan Eschenasy, PE, Chief Structural Engineer at the NYC DOB, who will be addressing retaining walls. This event is sure to be beneficial to all NYC design professionals who seek an opportunity to network, ask questions of their local officials, and stay up to date on important technical updates and guidelines. Please note speakers are subject to change. On Tuesday January 20th, newly appointed NYC Building Department (DOB) Commissioner Rick Chandler, PE held his first Commissioner’s Forum. Commissioner Chandler plans to make this a regular event where he and his top DOB officials meet with the design and construction industry. 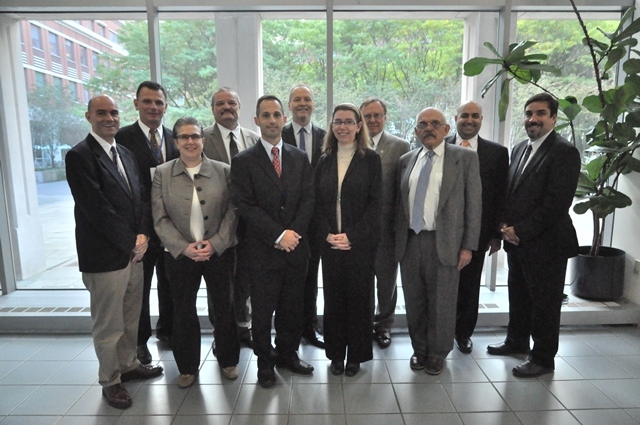 The event was attended by representatives of the AIA, ACEC, BIA and NYSSPE. The forum started with a presentation from Commissioner Chandler concerning his vision and direction for the DOB going forward. Being a Professional Engineer and someone who came up through the ranks at DOB, Commissioner Chandler is familiar with the issues engineers face in dealing with the department. His goal is to try and streamline operations so that the department is more user friendly while maintaining public safety in the construction industry. The New York State Society of Professional Engineers in conjunction with the Association of Towns of the State of New York (AOT) will be offering continuing education seminars at the AOT 2015 Training School and Annual Meeting. The seminars will be held in New York City on February 16th and 17th from 10 am to 4:30 pm at the Hilton Midtown, 1335 Avenue of the Americas. Up to 10 professional development hours (PDHs) will be available including topics such as ethics, asset management, wetlands, chemical grouting, shear walls, electric markets and more. This will be the Association of Town’s 82nd Annual Meeting. The event attracts more than 1700 elected and appointed officials from more than three-quarters of the state’s 932 towns. Please join us for some very interesting seminars focused on infrastructure improvements and green/energy efficient measures. Click here for registration information – seats are limited. NYSSPE representatives met earlier this week with New York City Department of Buildings (DOB) Representatives to discuss areas of mutual concern. DOB Commissioner Rick Chandler, PE facilitated the meeting after the successful NYSSPE Day for NYC Design Professionals event held last November, where Chandler was the keynote speaker. The primary focus of the meeting was for NYSSPE to offer to assist the DOB in any way possible with respect to illegal practice in New York City. The discussions were very positive and it does appear that NYSSPE will be able to help the DOB moving forward. Some topics discussed included the building permit process including the role of expeditors, and also the current Special Inspections guidelines. NYSSPE expects to have more correspondence with the DOB on this issue in the near future and as always, we will keep our members up to date.